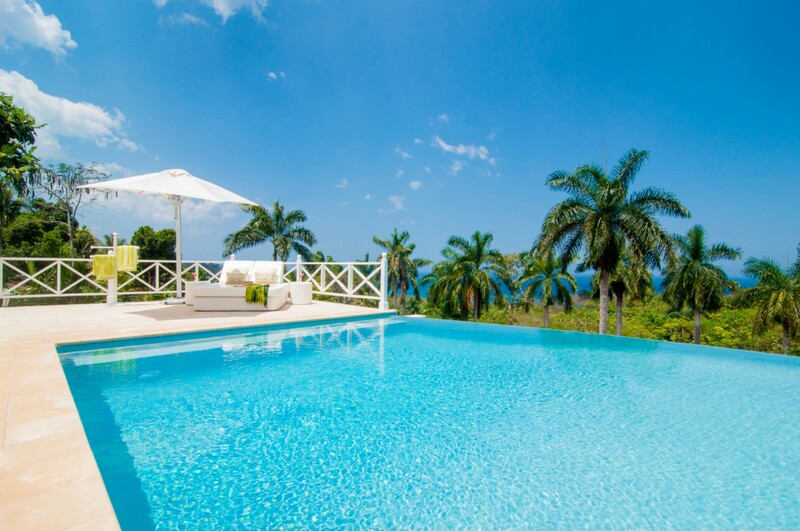 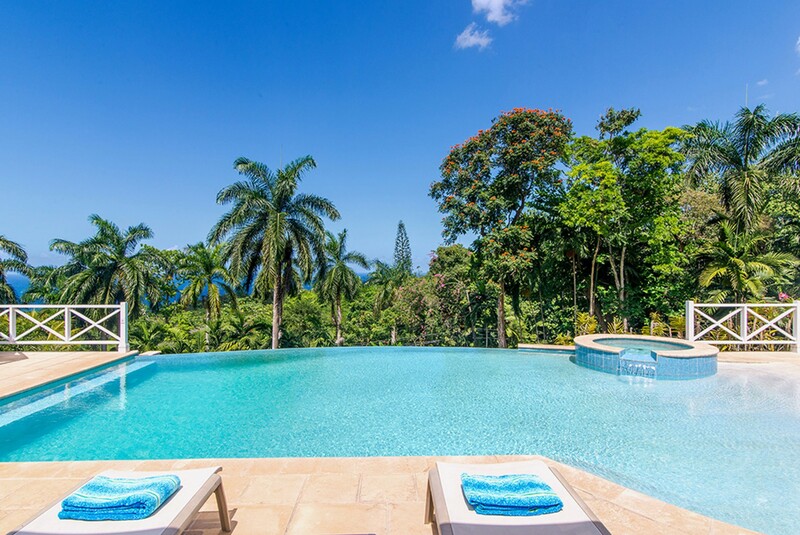 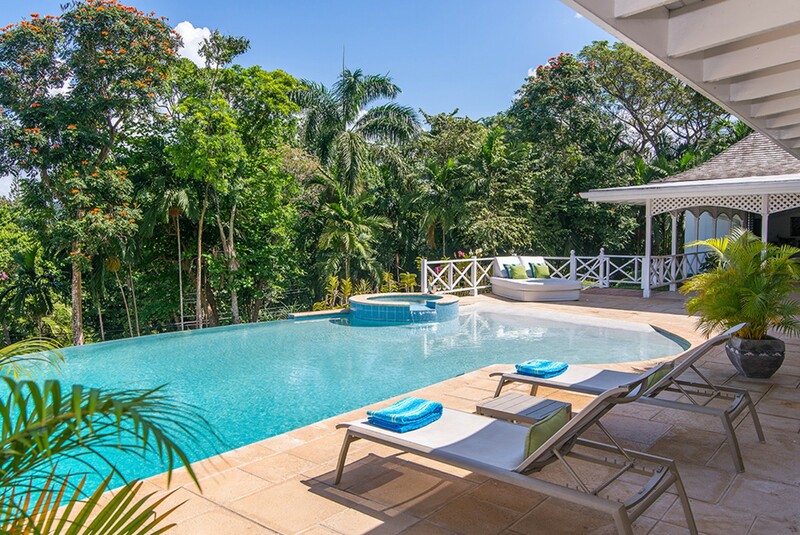 Welcome to Allamanda Villa Jamaica, a beautiful new 8000 square foot contemporary 5 bedroom villa located on a hill side close to Roundhill on the east side of Montego Bay. 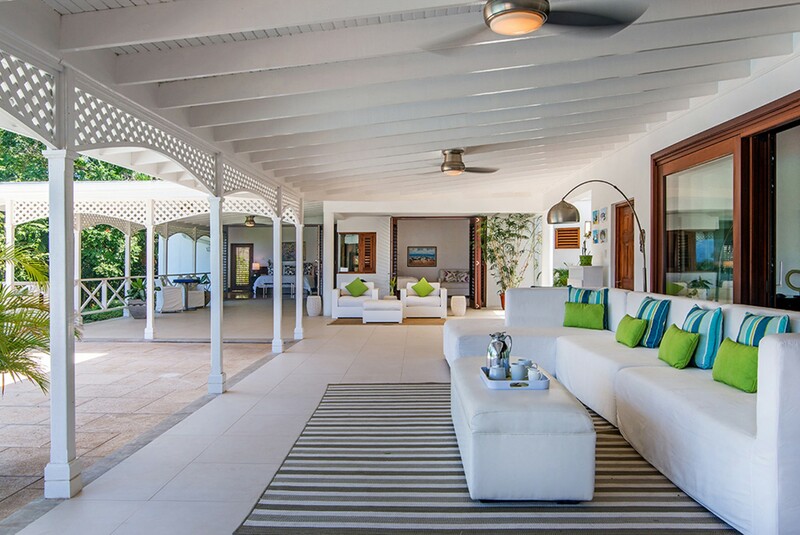 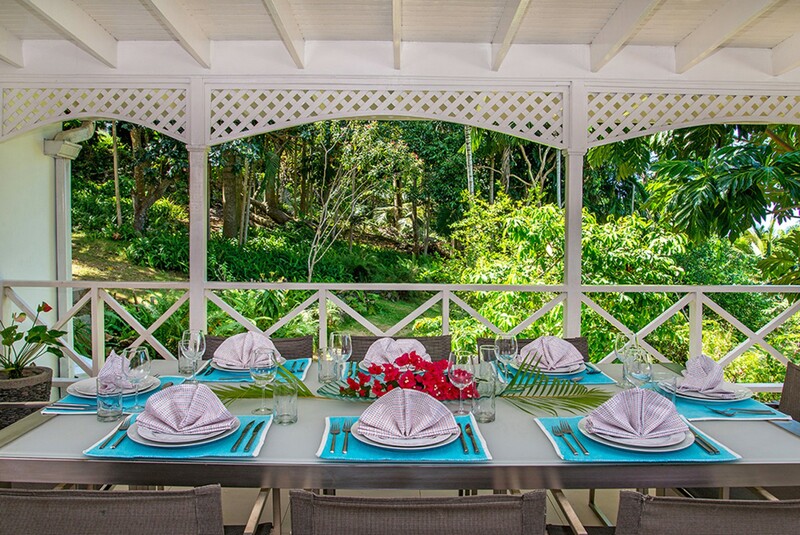 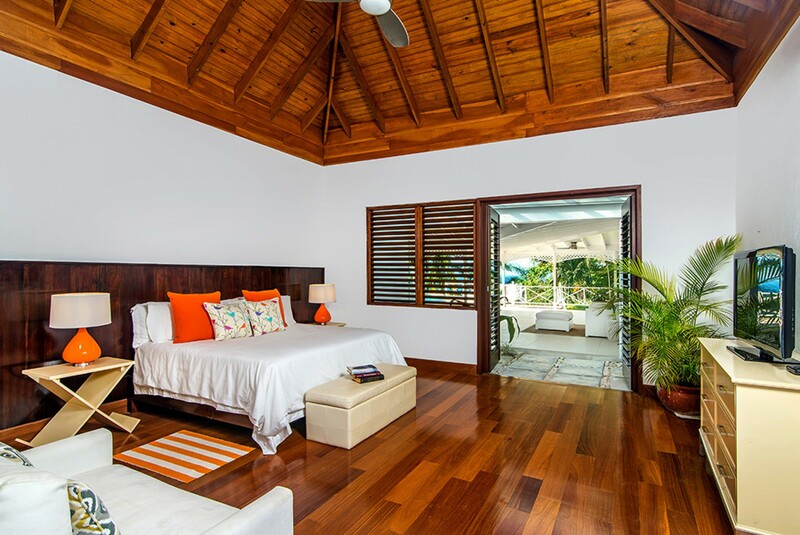 Allamanda comes with one of the best chefs on the island and has stunning views of the ocean and also has complimentary membership of both Roundhill Beach and Tennis club and the Tryall Golf, tennis and beach club. 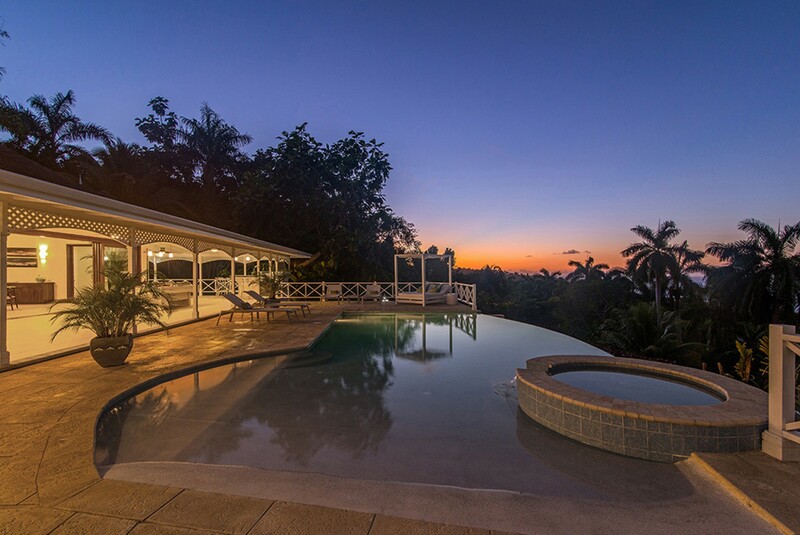 Without a doubt, the magical light and scenery in Jamaica has inspired this incredible 5 bedroom house. 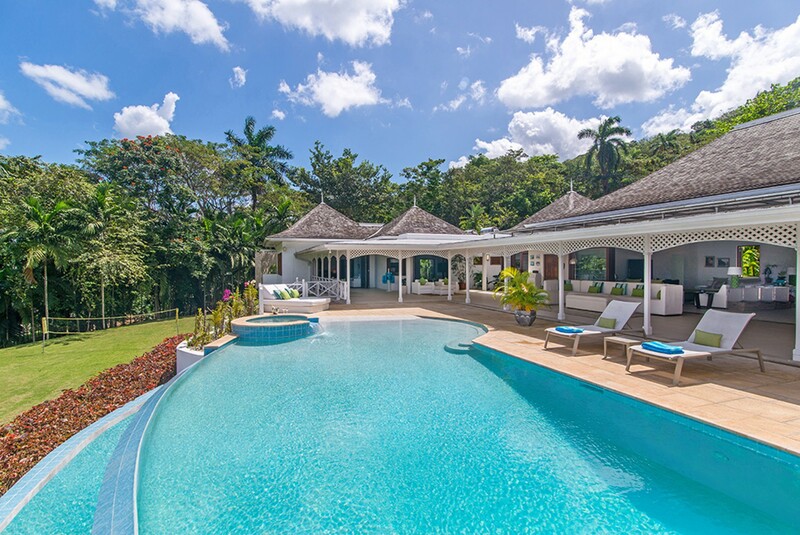 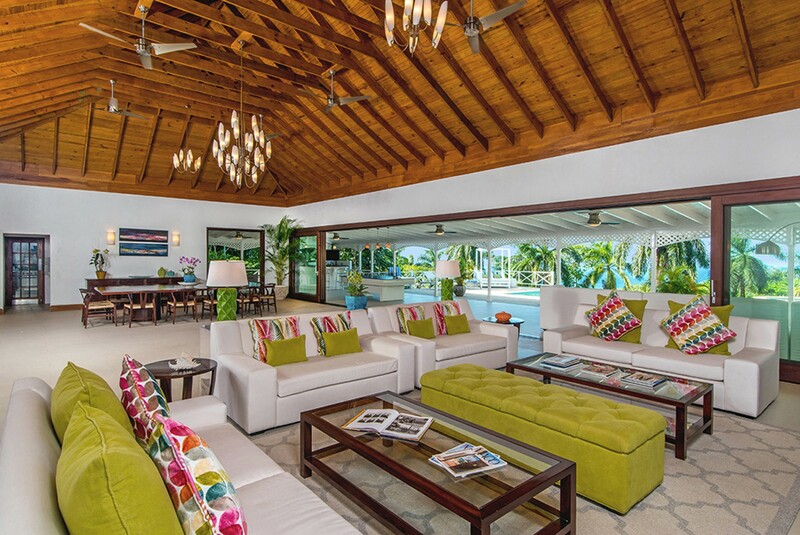 This beautiful Jamaica Villa has been built on one level. 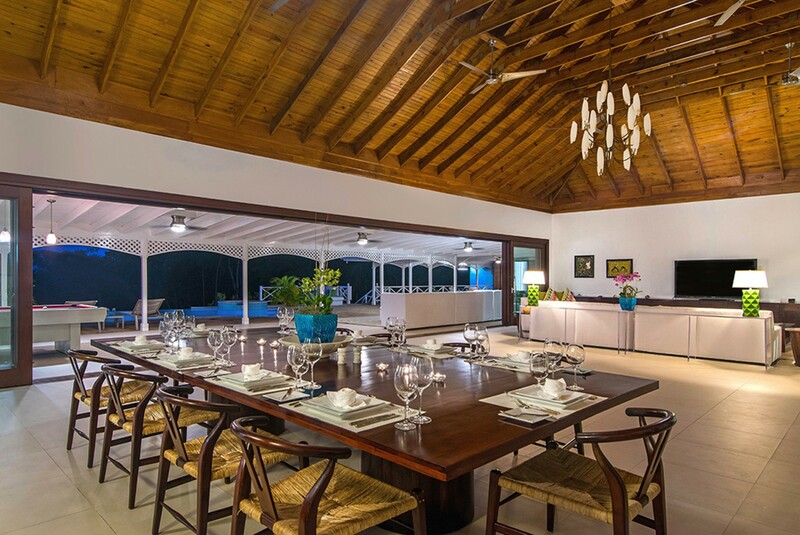 It has an incredible double height living room that opens via fifty feet sliding doors onto a huge covered terrace overlooking the pool area and takes full advantage of the spectacular views. 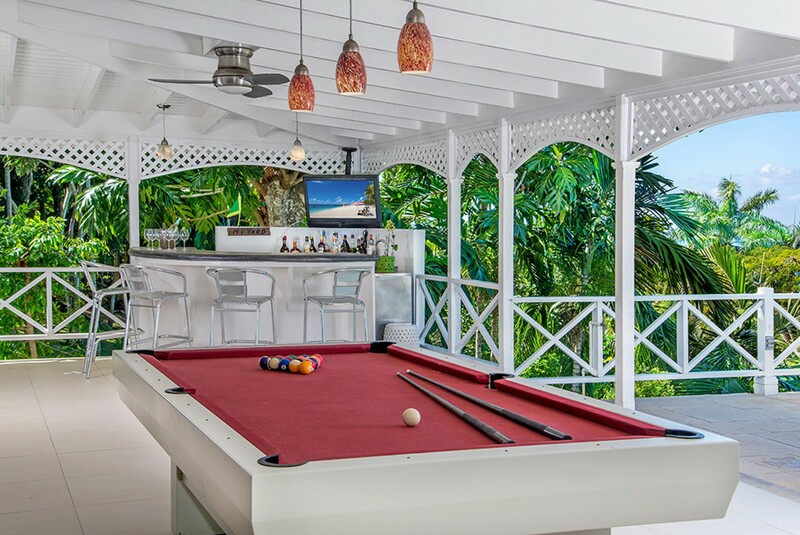 The Terrace has a lovely comfortable sitting area, outdoor dining table for up to 14 people, billiards, table tennis, outdoor TV and chill out area. 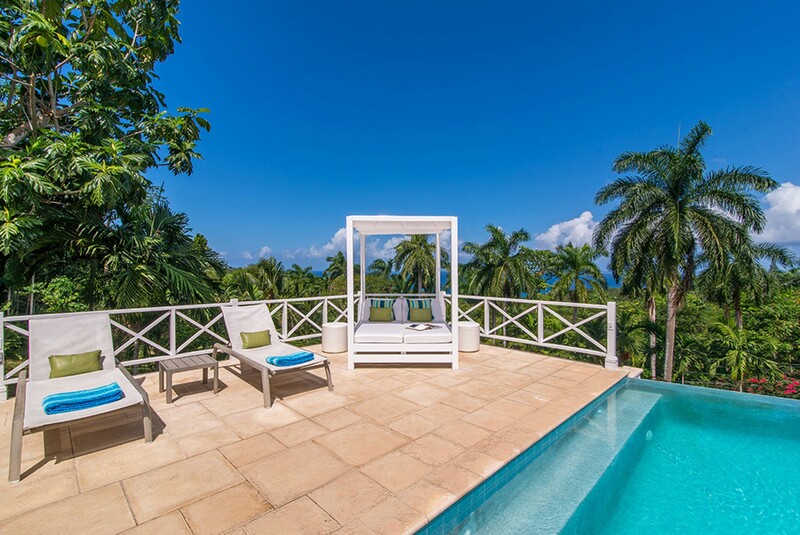 It is ideal for sunbathing, reading or just looking at the incredible views to the sapphire waters and endless horizon. 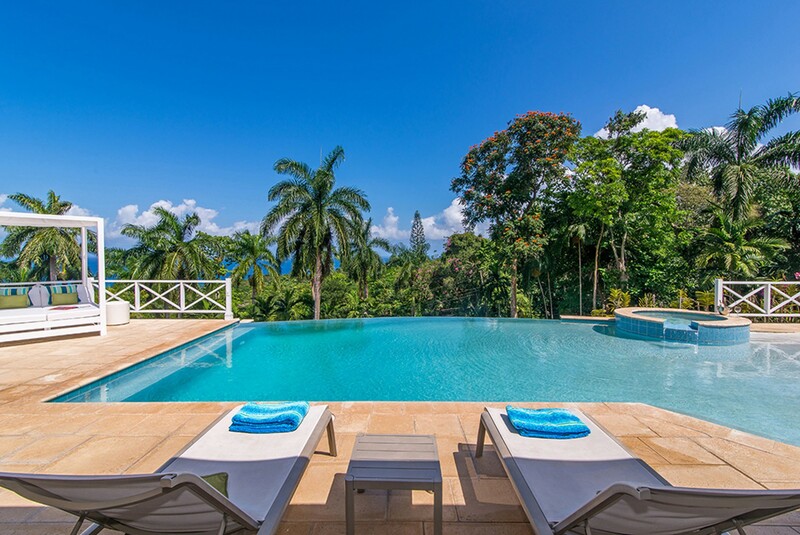 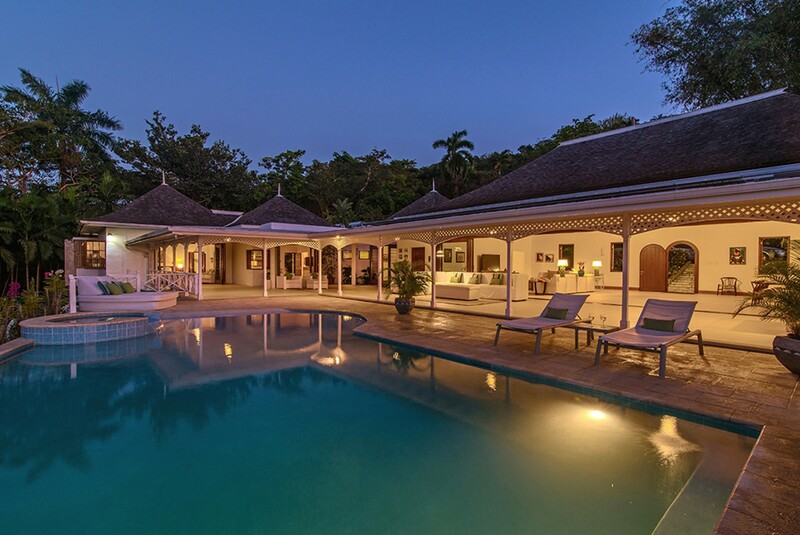 Alternatively you can relax in the warmth of the Jamaican air with an ice cold glass of champagne or cocktail with friends and family whilst looking at the stunning sunsets which are so often a feature of this part of the Island. 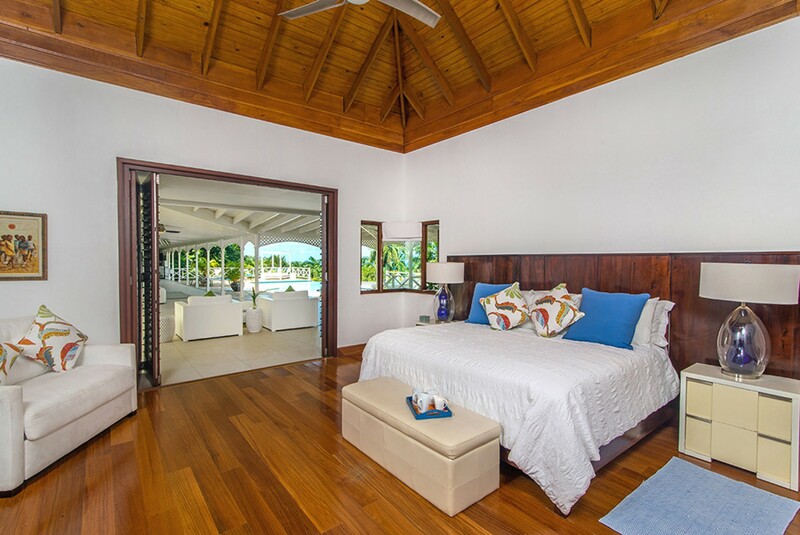 Three master bedrooms are accessible via the terrace or an interior hallway. 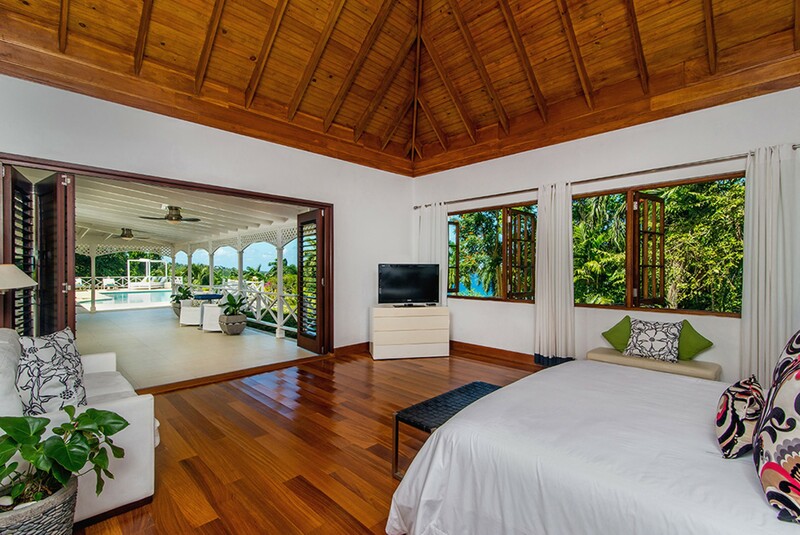 Two of these measure eighteen feet squared, and have en-suite bathrooms with walk in showers and walk-in closets. 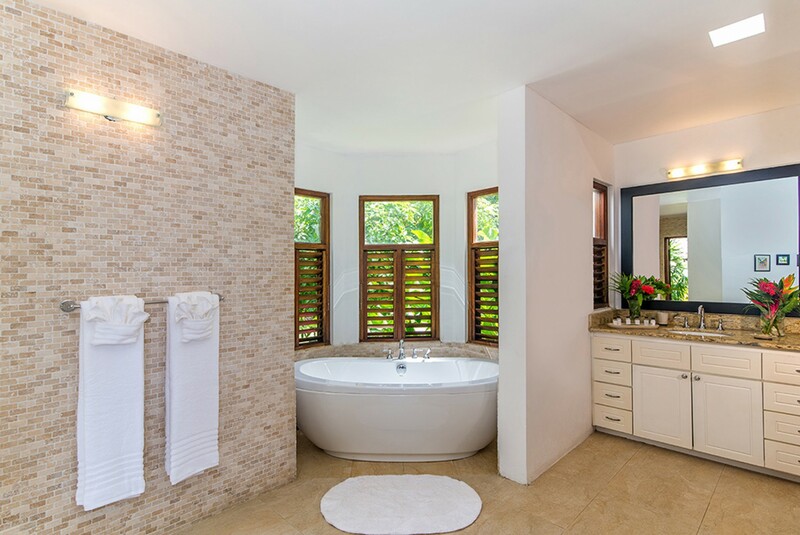 The third master measures twenty feet squared and has a en-suite bathroom with walk-in shower, an outdoor shower, and Jacuzzi bathtub. 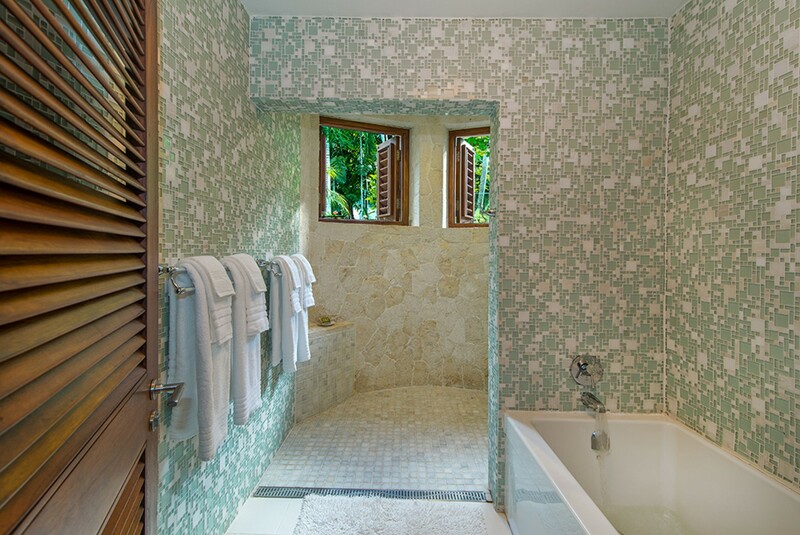 There is also a two bedroom family suite which share an en-suite bathroom with walk-in shower and bathtub. 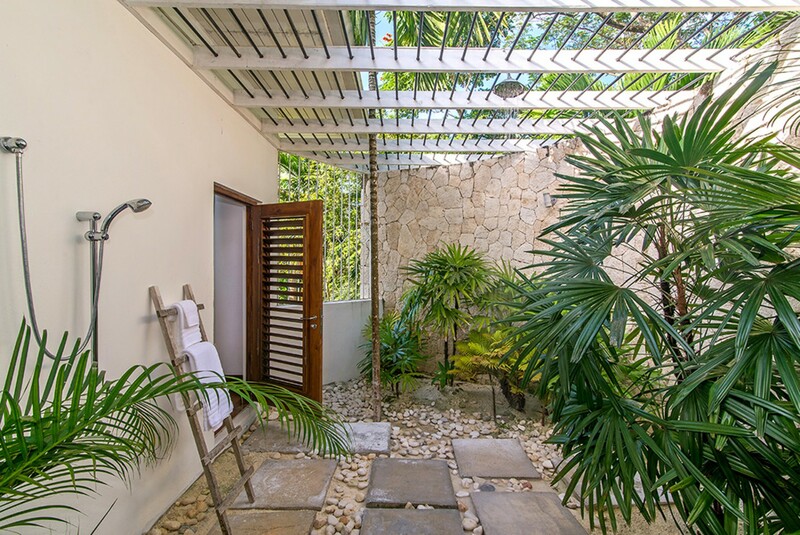 The parents (or nanny) room, considered the forth master, has a secure private outdoor garden. 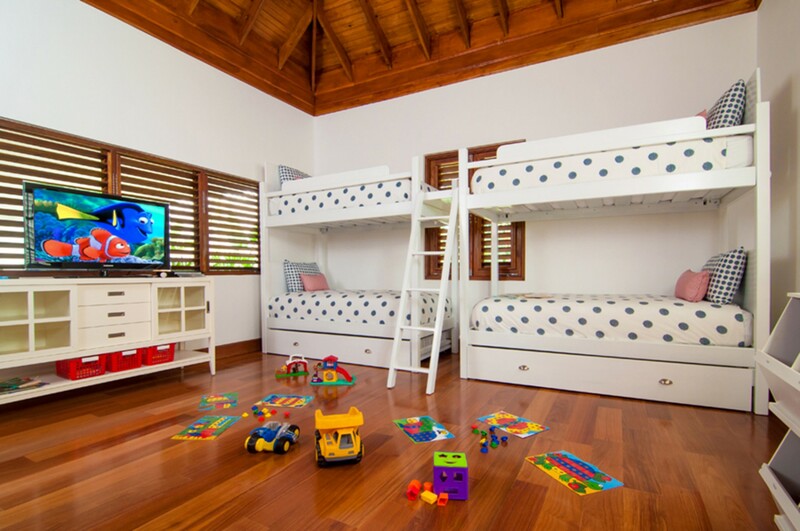 The children's room has two sets of custom made bunk beds and a video game system. 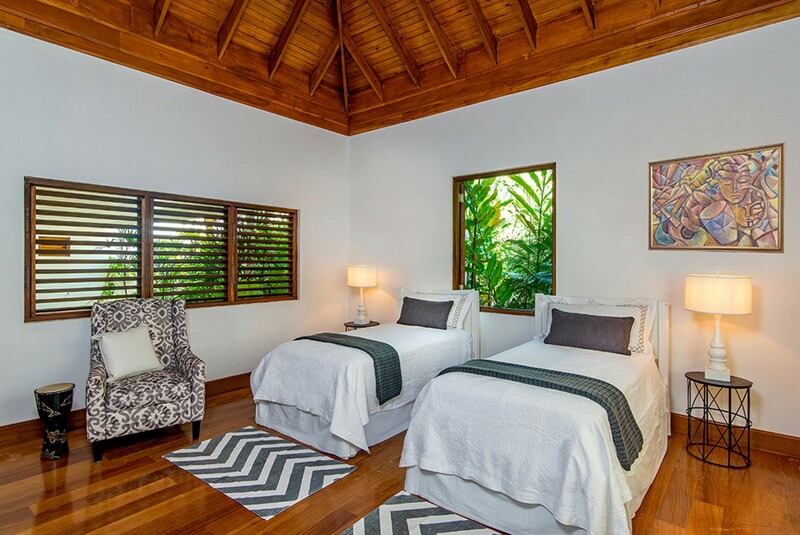 All bedrooms have been floored in beautiful teak wood, are comfortably air conditioned and have forty-two inch televisions with cable access. 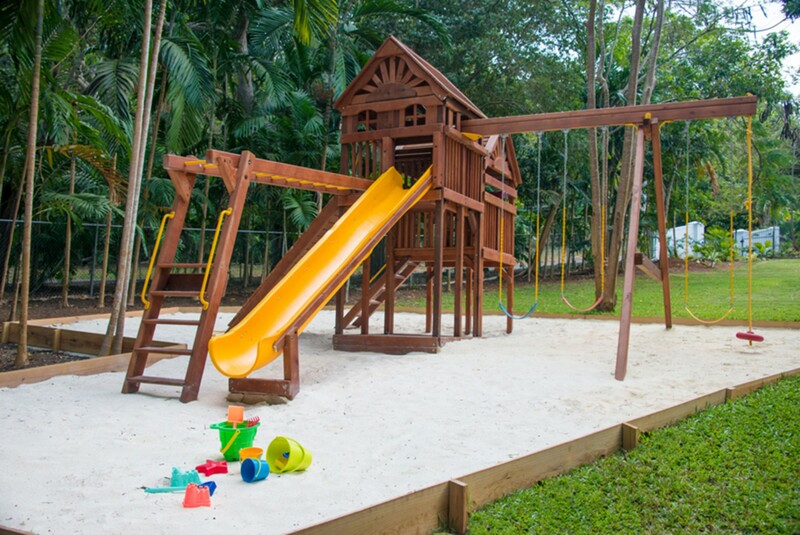 Allamanda villa is surrounded by two acres of manicured grounds which includes an impressive play scape for children with swings, and a fifteen foot slide. 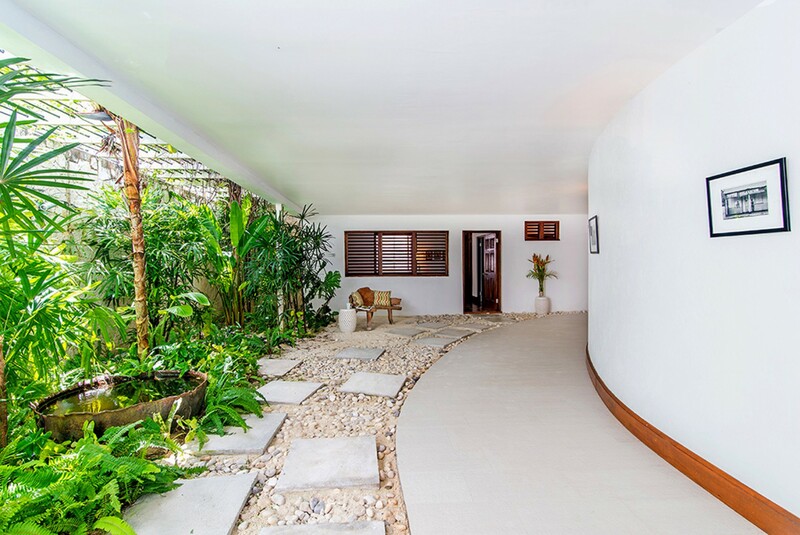 Incorporated into the drive-way is a half basketball court. 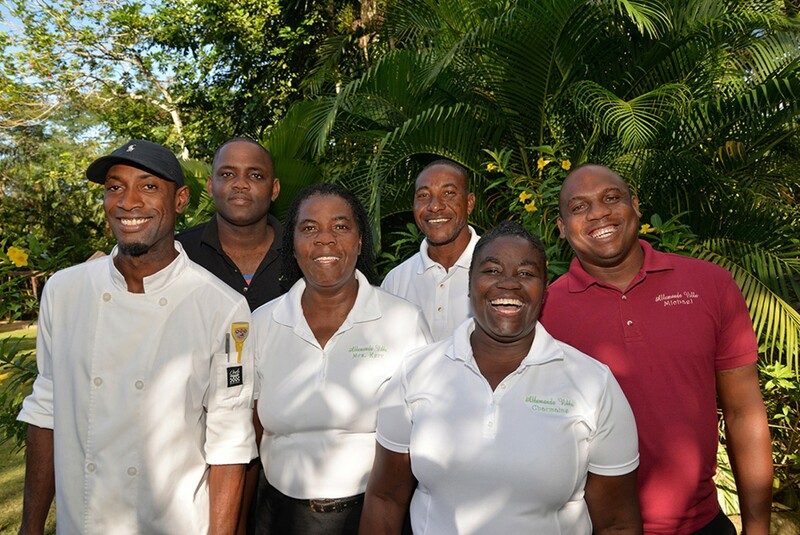 STAFF When you stay at Allamanda, you will be personally cared for by your own Butler, chef, two housekeepers, a laundress and a night manager all of whom will cater to your every need. 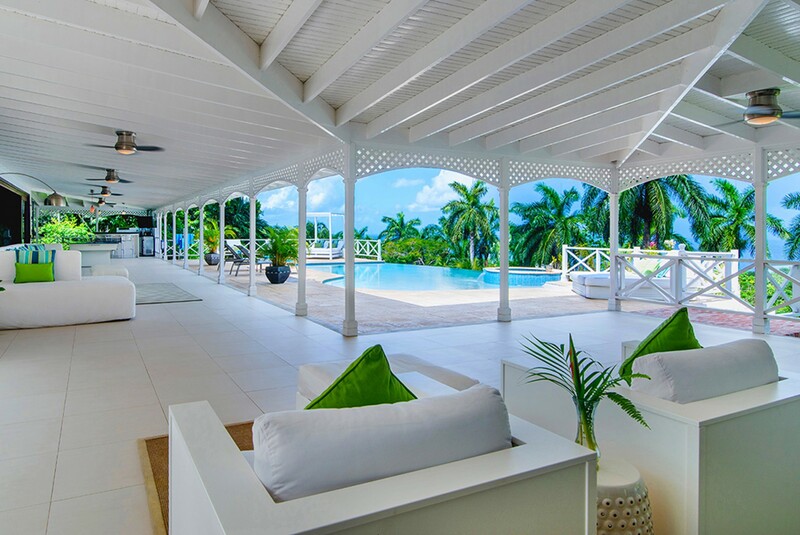 ■ 8,000 Interior Square Ft.
Allamanda truly is a superb home to relax with friends and family... As soon as I arrived here I didn't waste too much time before I was in this villas beautiful infinity pool... And our butler Junior took care of us with a refreshing beverage and hor d'oeuvres poolside! 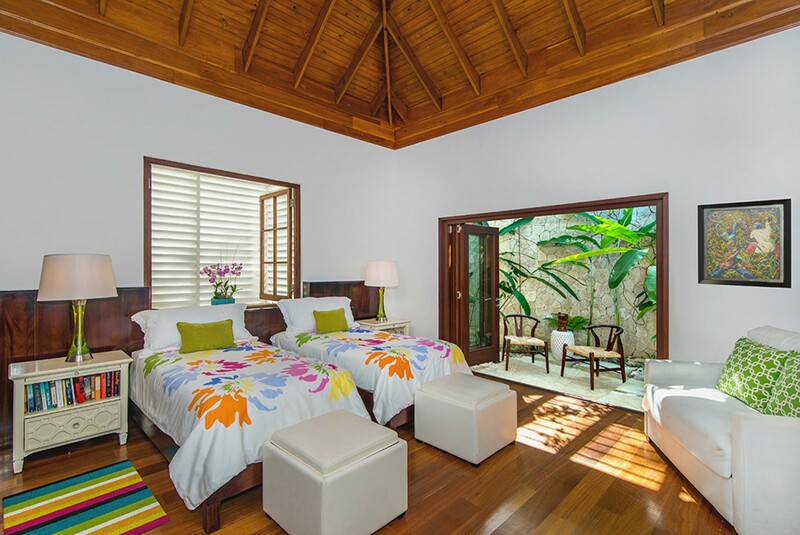 The bedrooms are immaculately and stylishly decorated with spacious ensuite bathrooms... 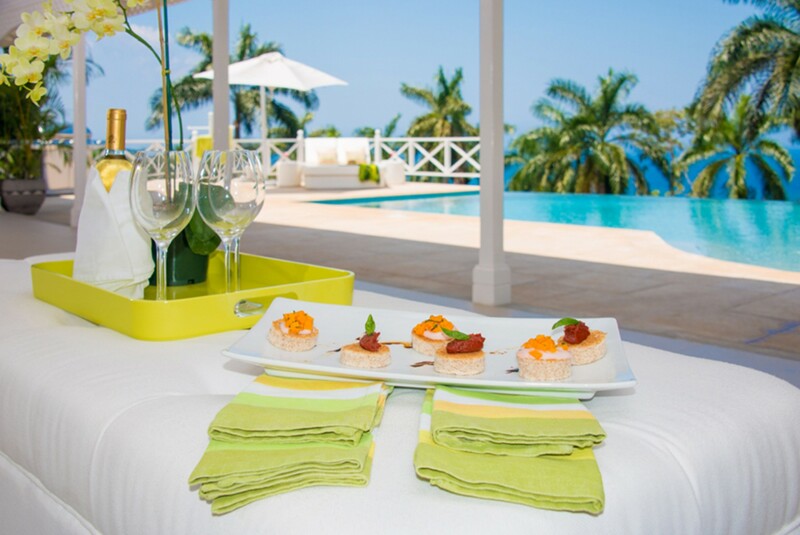 The villas chef Derval will not disappoint you with his delicious creations!